Protestors gathered outside Immigration Minister Peter Dutton’s Dickson electorate office at Strathpine to oppose potential federal budget cuts to Prince Charles Hospital. As morning traffic passed by, about 15 protestors in hospital outfits chanted “save our hospital, put LNP last”. Some cars honked in support. The demonstration was organised by online lobby group GetUp as part of a national campaign to save hospitals from cuts. GetUp said its projections showed the Prince Charles Hospital could lose up to $594 million in federal funding over the next 10 years. The group said that figure represented about 356 hospital beds, or 619 nurses, or 304 doctors and would lead to longer emergency room and elective surgery waiting times. 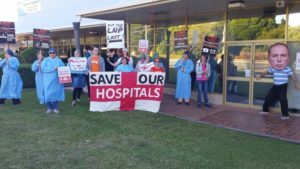 Sue Laird, a former candidate for Moreton Bay Region Council, said it was important jobs and hospital beds were not lost. A petition organised by Strathpine resident Pattie Hobbs was handed in at the minister’s office. The office asked for the petition to be brought in by the supervising police officer, Senior Sergeant Tim Beard. Office staff said this was to avoid any confrontation following former aggressive protests. A spokesperson for Health Minister Sussan Ley said GetUp’s claims and figures were incorrect or out-of-date, and an April agreement between the Prime Minister and states and Territories injected $2.9 billion into the public hospital system.